Kurfürst - Vergleichsfliegen Bf 109 E, Bf 110 C, Spitfire, Hurricane und Curtiss. to translate them into English. spelling or translation mistakes. Email at kurfurst@atw.hu. For French Tactical Trials with a captured Bf 109E-3 vs. French fighters, see HERE. Major Werner "Vati" Mölders, Kommodore of JG 51 during the Battle of Britian, participated in the comperative trials at E-Stelle Rechlin, during which he flew both the Spitfire and the Hurricane, on which he recalled, in agreement with the report below. "It was very interesting to carry out the flight trials at Rechlin with the Spitfire and the Hurricane. Both types are very simple to fly compared to our aircraft, and childishly easy to take-off and land. The Hurricane is good-natured and turns well, but its performance is decidedly inferior to that of the Me 109. It has strong stick forces and is "lazy" on the ailerons. 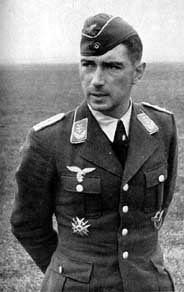 Mölders proved very successfull during the Battle, despite a poor start on 28 July, when he lead his unit the first time into combat, and was wounded in combat with Spitfires but also shooting one down one in the confusion. During the Battle he was victorious in 29 air combats against RAF fighters (14-14 aerial victories against Hurricanes and Spitfires, and another against a FAF Curtiss), culminating on 31 August, when he downed 3 Hurricanes in quick succession, repeating the same feat on 12 and on 22 October once again; ulimately finishing the Battle with 54 victories to his name. Bf 109 E 4.4 min, Spitfire 5 min, Hurricane 5.6 min, Curtiss 5.2 min. superior up to 6.5 km. Spitfire is equal at ground level, otherwise superior. behind an enemy fighter with the same angle. all three foreign planes have significantly smaller turning circles and turning times. The Spitfire and partly the Hurricane have two-pitch propellers. hand with high blade angle high boost pressure – therefore in other words, performance loss. due to the negative acceleration. This [evasive] measure is also recommended. The rolling ability of the enemy fighters at high speeds is worse than that of the Bf 109. 1 - Quoted from Page 61 - Osprey's Aircraft of the Aces - 'Spitfire Mk.I/II Aces' by Dr. Alfred Price. 3 - From Page 9 of 'Messerschmitt Bf109 F,G, and K: An Illustrated Study' by Jochen Prien/Peter Rodeike. Schiffer Publishing 1993. Last updated 6 August 2006.